FieldMate, laser power meter, improves upon a familiar method of peaking laser power - the analog needle. With faster electronics and sophisticated digital processing, the FieldMate’s analog needle responds faster and with less overshoot than current meters, enabling rapid, precise laser adjustment. FieldMate is compatible with all PowerMax thermal sensors and a variety of optical sensors, allowing its use with lasers from the ultraviolet to the infrared, from nW to kW. Built-in wavelength compensation ensures that readings at any wavelength will remain accurate. 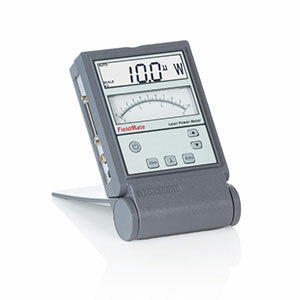 This meter provides an economical way to perform laser power measurements and laser tuning.